VANCOUVER, British Columbia, Oct. 09, 2018 (GLOBE NEWSWIRE) -- K92 Mining Inc. (TSX-V: KNT; OTCQX: KNTNF) (“K92” or the “Company”) is pleased to announce results from the continuing diamond drilling of the Kora North Extension. The results from Diamond Drill Cuddies 3 and 4 (DDC3 and DDC4) continue to extend both the K1 and K2 lodes while also further delineating the KL structure and confirming its continuity. See Table 1 below for a summary of drill results including true widths. Long sections showing all holes drilled to date in both K1 and K2 is provided below. Table 1 provides a summary of the results from KMDD0100, 101, 102 and 104 diamond drill holes drilled from DDC3 and 4. Note that KMDD0101 was terminated prior to the projected intersection of K2 due to slow penetration rates through wet broken ground. Table 2 provides details of collar location and hole orientation. The current Kora/Eutompi Inferred Resource estimate, as defined by previous drilling to date, is 4.36 million tonnes at a grade of 7.3 g/t Au, 35 g/t Ag and 2.23 percent Cu, or 11.2 g/t gold equivalent (see Table 3) and is open for expansion at depth and in both directions along strike. 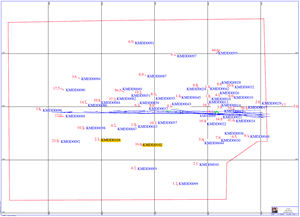 K92 has filed and made available for download on the Company's SEDAR profile a technical report titled, "Independent Technical Report, Mineral Resource Update and Preliminary Economic Assessment of Irumafimpa and Kora Gold Deposits, Kainantu Project, Papua New Guinea," with an effective date of March 2, 2017, that provides additional information on the geology of the deposits, drilling and sampling procedures, lab analysis, and quality assurance/quality control for the project, and additional details on the resource estimates. Excluding initial capital expenditure of $14 million (U.S.), cash cost is estimated to be $547 (U.S.) per ounce AuEq (inclusive of a 2.5 percent net smelter return (NSR) royalty) and all-in sustaining cost (AISC) of $619 (U.S.) per ounce AuEq for 25-metre mining levels, or $549 (U.S.) per ounce (inclusive of a 2.5 percent NSR royalty) and AISC of $644 (U.S.) per ounce AuEq for 15-metre mining levels. M in Table is millions. Reported tonnage and grade figures are rounded from raw estimates to reflect the order of accuracy of the estimate. Minor variations may occur during the addition of rounded numbers. Gold equivalents are calculated as AuEq = Au g/t + Cu%*1.52 + Ag g/t*0.0141. In addition to the above Irumafimpa and Kora/Eutompi Resources, K92 has also defined an additional resource at Kora North comprising a Measured Resource of 242,900 tonnes @ 13.9 g/t Au, 19 g/t Ag and 1.0% Cu; an Indicated Resource of 442,800 tonnes @ 11.8 g/t Au, 21 g/t Ag and 1.2% Cu and an Inferred Resource of 1,084,400 tonnes @ 13.2 g/t Au, 15 g/t Ag and 1.0% Cu. See Table 4 below. Gold Equivalent (Au Eq) g/t was calculated using the formula Au g/t + (Cu% x 1.53) + Ag g/t x 0.0127. A top cut of 100 g/t was applied to the gold assays for the K1, K2 KL lodes. All material mined from within the resource envelope up to the effective date of the resource have been removed from the model. 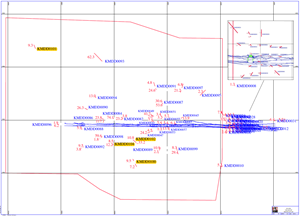 Wireframes were constructed to constrain lode positions based on geological mapping and logging of workings and diamond core coupled with the use of face and drill core assay results using a nominal +1 g/t Au cut-off to define the lode boundary. Equal length composites of 0.5m were extracted from the database for each lode. A top cut to gold grade was applied to K2, K1 and KL1 of 100g/t. The ordinary kriging modelling estimation method was then used with search radii of 35m and 130m for Au, Ag and Cu. At least 3 informing values with a maximum of 12 were used to estimate each model block. The Resource was classified as measured if both drilling at 25m centres and workings were present, as indicated if only drilling or workings were presented and inferred for material 15m past the last drill hole or working.